Traditional media remains among the top 10 most shared links alongside #BTW17, with Twitter users sharing links to the conservative-leaning Die Welt the most. The level of bot activity related to #BTW17 appears lower than in other elections, such as in the United States and France, and the impact of political bots and other troll accounts is limited. A coordinated social media offensive (#NichtmeineKanzlerin) against Merkel appeared in the days leading up to the #Wahlarena and was characterized by memes attacking her refugee policies. Since the last issue, we collected an additional 165,090 tweets containing #BTW17, the main hashtag associated with the German elections. As of of 9 September, we had a total of 299,842 tweets for analysis. There has been a marked increase in the frequency of tweets using #BTW17 since August, and the number of Twitter accounts using the hashtag have more than doubled. 49,128 accounts used #BTW17 in our collection of tweets. We retrieved account information for 48,069 accounts, which included data such as the setup language of the account, the number of status updates, followers, and creation dates. A large amount of accounts using #BTW17 were created in 2009 and 2017. 2009 was a special year for Germany – a so-called “Superwahljahr” – and it came on the heels of President Barack Obama’s electoral victory, which was in part credited to social media. The large spike in Twitter accounts created in 2009 could thus be related to this phenomenon. How many bots might be actively using #BTW17? After the US and French elections, bot activity has become the object of focus for many researchers, particularly on Twitter. One way of spotting an automated account is to divide the account’s total tweets by its creation date, which yields the number of tweets per day. The Atlantic Council’s Digital Forensic Research Lab sets a threshold for suspicious accounts as those which tweet 72 times per day, or one tweet “every ten minutes for twelve hours at a stretch.” 2.3% of #BTW17 accounts fit this criterion when calculating their creation date by the account’s total tweets. Most of the accounts in this group were created in the last 1-2 years and tweet between 72-200 times per day, with some extreme outliers. Another way to identify automated accounts is to look at alphanumeric screen names or those ending with a sequence of eight digits, which are two clues that the account might be a bot. There are 423 such accounts using #BTW17. More recent accounts among this group are entirely anti-Merkel or anti-refugee in nature; however, these accounts do not all have a rate of tweeting that suggests automation. Examples of such accounts include @Jrgen22547214, @ASD5583393831, and @AlexAmg41831967. Other accounts display several bot-like traits, such as anonymity and amplification: the account @Ruby37659016, for example, has the default profile image and tweets an average of 130 times per day, with 85% retweets, many in support of the AfD. Similar accounts include @hesti5759 and @TutemanTuts. On 11 September, we identified the latter as part of a group of accounts using the hashtag, #NichtmeineKanzlerin, which rose in prominence shortly before Merkel’s appearance on the #Wahlarena and used numerous sets of memes to attack Merkel and her policies. 30% of these accounts were created in the last 30 days and almost 50% in the last 6 months, resulting in a right-skewed histogram. The most active accounts, however, were created in just the previous two weeks. The scatter plot below shows age of accounts vs. the number of tweets using #NichtmeineKanzlerin. The majority of high frequency accounts are clustered on the left side. Traditional media remains among top 10 outlets shared with #BTW17. As in our last issue, Die Welt is the most shared media. An explanation may be that many of the top tweeters of #BTW17 are supporters of the AfD (other social media research has shown that the AfD is more inclined than other parties to share links to Die Welt). #Hashtags: What were people talking about? 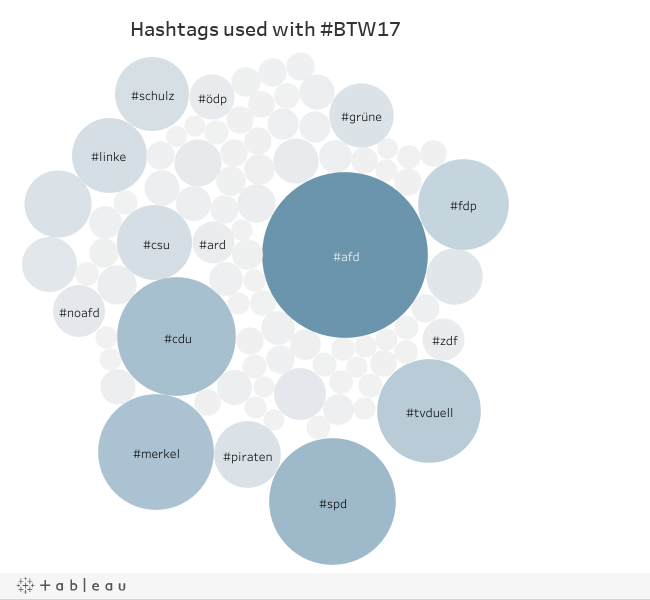 There have been 18,112 unique hashtags used with #BTW17 so far. References to political parties and campaign slogans remain the most frequent co-occurring hashtags. The chart below contains the most frequent hashtags with the exception of #BTW17, #BTW2017, #Bundestagswahl2017 and related hashtags. Which tweets received the most engagement? There was a varied mix of retweets by journalists, media, political parties, and others. The highest retweet was by a journalist at the Spiegel, who shared a post from her Facebook page about why the election has proven to be anything but boring.